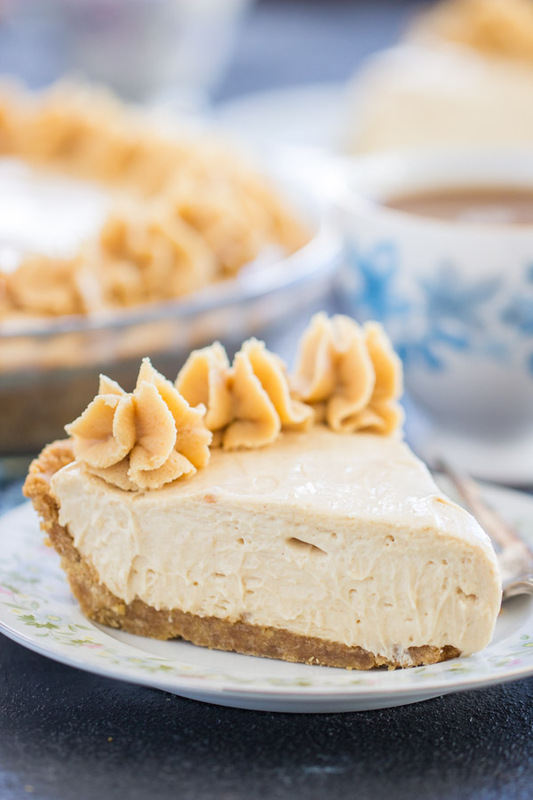 My Grandma’s No-Bake Peanut Butter Pie recipe is so popular on the blog. Understandably so. It comes together in about 10 minutes, and it’s ultra-creamy, rich, smooth, and peanut-buttery. Yet it still remains miraculously light and fluffy, kind of mousse-like. 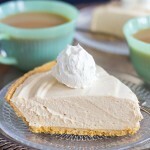 I like it with a shortbread crust because I find it to be more flavorful, but graham cracker is a classic option. 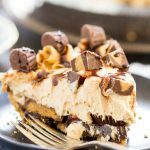 A few months ago I was making it for a family get-together, and I tweaked it to make this Reese’s Cup No-Bake Peanut Butter Pie recipe. That version is black-bottomed, featuring a layer of chocolate fudge on top of the crust, then a layer of full-size Reese’s cups (eep!). It’s pretty insane. That variation was such a hit that it got me brainstorming the ways that I could continue reinventing this classic pie. 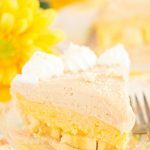 It’s such a simple recipe, but it’s a dessert that everyone loves, and it comes together in about 10 minutes. 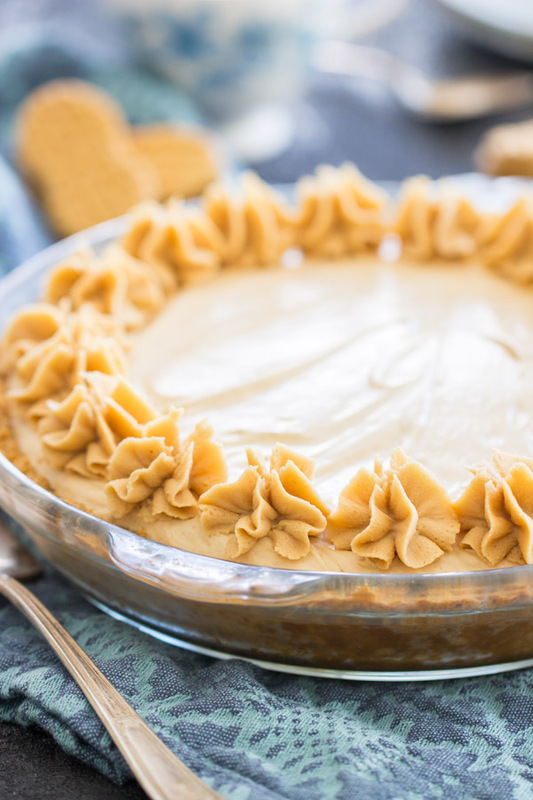 With this Nutter Butter No-Bake Peanut Butter Pie, I didn’t want to stray a lot from those basic components. I wanted it to be easy and simple, fast to make, and overwhelmingly delicious. 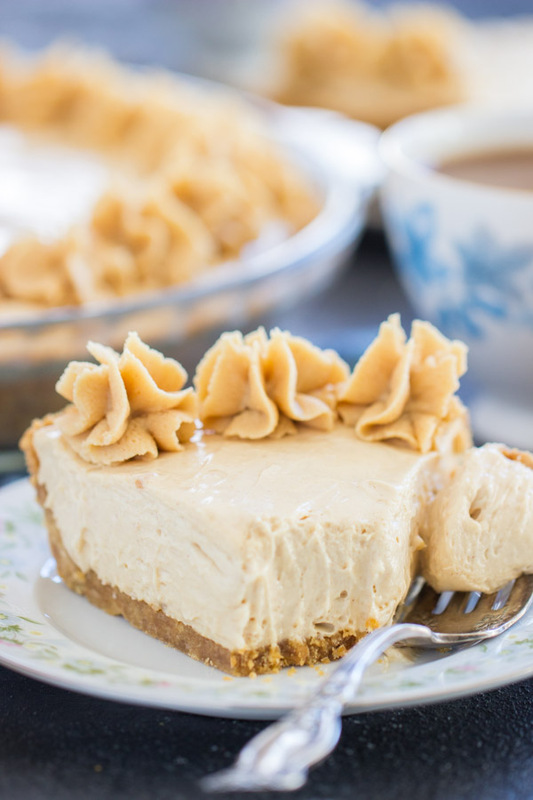 This Nutter Butter No-Bake Peanut Butter pie version delivers on all of that. It’s still extremely fast and simple… my cat could practically make this pie. Not to short-change her though – she’s one smart cookie (and just had her 18th birthday, btw!). 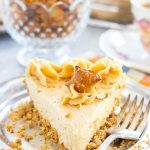 This pie touts all the wonderfully awesome qualities of the classic peanut butter pie recipe, with lots of peanut butter goodness, and a rich creamy, filling. 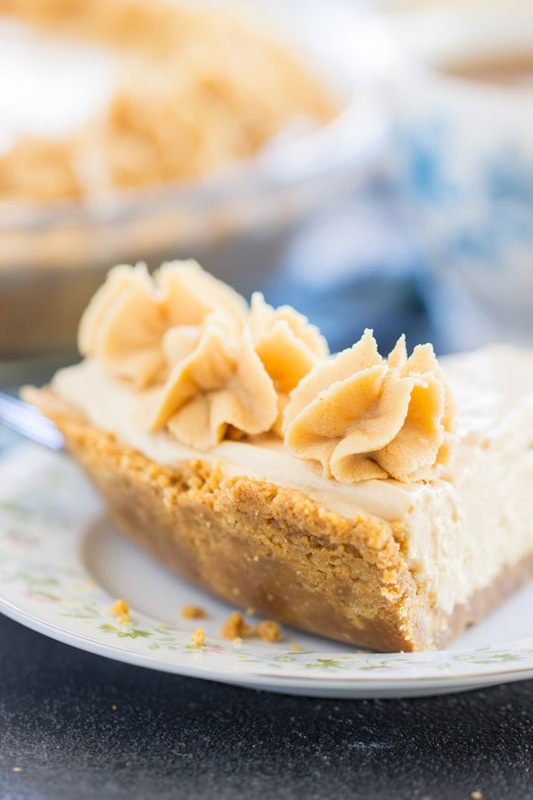 What sets this Nutter Butter No-Bake Peanut Butter Pie apart is the crust. Obviously, crushed Nutter Butter cookies give added oomph to the peanut butter flavor in the pie. How do you make a peanut butter dessert better? Add more peanut butter. 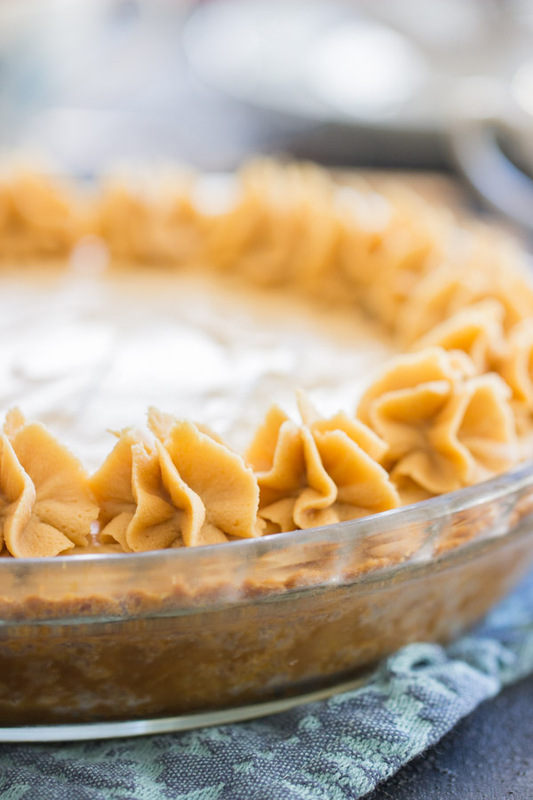 I’ve also swapped out classic shortbread or graham cracker crust for crushed pretzels, and created this No Bake Peanut Butter Pie with Pretzel Crust. The salty element is fabulous! Then I’ve made that pie with a layer of fudge on the bottom – a black-bottom version, and smattered with a few peanut butter cups. It’s this Peanut Butter Cup Fudge Pie. Hello decadence! Even MORE Reese’s cups went into this Reese’s Cup No Bake Peanut Butter Pie recipe. It’s CRAZY with Reese’s cups. 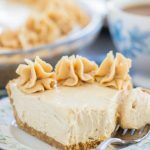 Creamy, rich, peanut butter pie with a Nutter Butter cookie crust! 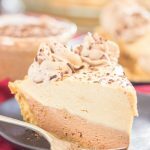 This Nutter Butter Peanut Butter Pie recipe is fast & easy! Ready in minutes! In a medium bowl, combine cookie crumbs, sugar, and melted butter. Bake at 350 degrees for 9-10 minutes, or until crust is set. In a large mixing bowl, combine peanut butter, cream cheese, powdered sugar, and about half the whipped topping (eyeball it). Spread evenly over the pie crust. Refrigerate until thoroughly chilled, about 1 hour. If desired, pipe peanut butter buttercream around the edges with a star tip. I pretty much always have leftover frosting from recipes, so I just used what I had left from something else, but you don't need to do this - it's strictly for garnish! OMG I’m drooling over here! So yummy! I love tweaking classic recipes to make something new- and I’m with you – the more peanut butter, the better! This pie is soon delicious! Definitely a keeper !